Want more ATTENTION from your dog? Want your dog to think you’re FUN? Learn to PLAY with him, the way HE likes to play! Learn to communicate better and be ‘fun and playful’ for your dog because this is key to building your relationship with him! Overall, simply focus on just making it super fun and play whatever way your dog likes best! Movement – towards/away, paws, zoomies, etc. Some Dogs LOVE to chase things on a string, especially squeaky toys, plastic bags and everything else that makes sound! Some dogs hate squeaky toys, but go crazy for real fur and ladder gloves – probably because it smells like food. Some Dogs don’t care so much about what toy we use, so long as I’m involved! Try running away and making silly noises. How about when my dog has a toy and I’m pretending I want to steal it from her, but then she turns and begins chasing me with it instead! 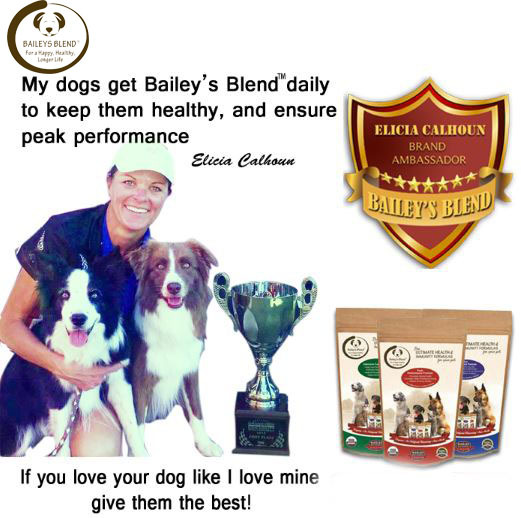 Elicia Calhoun has been teaching and Competing Internationally for over 26 years. She has represented the United States on 27 different world championship teams. Her award highlights include having won 3 World Championship Gold Medals as well as 4 National Championship Titles. Her gift is her ability to connect with dogs and develop an amazing relationship for that winning team.